The Iranian peoples, or the Iranic peoples, are a diverse Indo-European ethno-linguistic group that comprise the speakers of the Iranian languages. The Proto-Iranians are believed to have emerged as a separate branch of the Indo-Iranians in Central Asia in the mid-2nd millennium BCE. At their peak of expansion in the mid-1st millennium BCE, the territory of the Iranian peoples stretched across the entire Eurasian Steppe from the Great Hungarian Plain in the west to the Ordos Plateau in the east, to the Iranian Plateau in the south. The Western Iranian empires of the south came to dominate much of the ancient world from the 6th century BCE, leaving an important cultural legacy; and the Eastern Iranians of the steppe played a decisive role in the development of Eurasian nomadism and the Silk Road. The ancient Iranian peoples who emerged after the 1st millennium BCE include the Alans, Bactrians, Dahae, Khwarezmians, Massagetae, Medes, Parthians, Persians, Sagartians, Sakas, Sarmatians, Scythians, Sogdians and probably Cimmerians among other Iranian-speaking peoples of Western Asia, Central Asia, Eastern Europe and the Eastern Steppe. In the 1st millennium CE, their area of settlement was reduced as a result of Slavic, Germanic, Turkic, and Mongol expansions, and many were subjected to Slavicisation and Turkification. Modern Iranian-speaking peoples include the Baloch, Gilaks, Kurds, Lurs, Mazanderanis, Ossetians, Pamiris, Pashtuns, Persians, Tajiks, the Talysh, Wakhis, and Yaghnobis. Their current distribution spreads across the Iranian Plateau, stretching from the Caucasus in the north to the Persian Gulf in the south and from eastern Turkey in the west to western Xinjiang in the east—a region that is sometimes called the Iranian Cultural Continent, representing the extent of the Iranian-speakers and the significant influence of the Iranian peoples through the geopolitical reach of Greater Iran. The term Iran derives directly from Middle Persian Ērān (𐭠𐭩𐭥𐭠𐭭) and Parthian Aryān. The Middle Iranian terms ērān and aryān are oblique plural forms of gentilic ēr- (in Middle Persian) and ary- (in Parthian), both deriving from Old Persian ariya- (𐎠𐎼𐎡𐎹), Avestan airiia- (𐬀𐬌𐬭𐬌𐬌𐬀) and Proto-Iranian *arya-. Emmanuel Laroche (1957): ara- "to fit" ("fitting", "proper"). Old Iranian arya- being descended from Proto-Indo-European ar-yo-, meaning "(skillfully) assembler". Georges Dumézil (1958): ar- "to share" (as a union). Harold Walter Bailey (1959): ar- "to beget" ("born", "nurturing"). Émil Benveniste (1969): ar- "to fit" ("companionable"). The Bistun Inscription of Darius the Great describes itself to have been composed in Arya [language or script]. In the Iranian languages, the gentilic is attested as a self-identifier included in ancient inscriptions and the literature of Avesta. [a] The earliest epigraphically attested reference to the word arya- occurs in the Bistun Inscription of the 6th century BCE. The inscription of Bistun (or Behistun; Old Persian: Bagastana) describes itself to have been composed in Arya [language or script]. As is also the case for all other Old Iranian language usage, the arya of the inscription does not signify anything but Iranian. As the name of the language of the Old Persian version of the inscription of Darius I in the Bistun Inscription. As the ethnic background of Darius the Great in inscriptions at Rustam Relief and Susa (Dna, Dse) and the ethnic background of Xerxes I in the inscription from Persepolis (Xph). As the definition of the God of Iranians, Ohrmazd, in the Elamite version of the Bistun Inscription. In the Dna and Dse, Darius and Xerxes describe themselves as "an Achaemenid, a Persian, son of a Persian, and an Aryan, of Aryan stock". Although Darius the Great called his language arya- ("Iranian"), modern scholars refer to it as Old Persian because it is the ancestor of the modern Persian language. The trilingual inscription erected by the command of Shapur I gives a more clear description. The languages used are Parthian, Middle Persian, and Greek. In Greek inscription says "ego ... tou Arianon ethnous despotes eimi", which translates to "I am the king of the kingdom (nation) of the Iranians". In Middle Persian, Shapur says "ērānšahr xwadāy hēm" and in Parthian he says "aryānšahr xwadāy ahēm". The Avesta clearly uses airiia- as an ethnic name (Videvdat 1; Yasht 13.143–44, etc. ), where it appears in expressions such as airyāfi daiŋˊhāvō ("Iranian lands"), airyō šayanəm ("land inhabited by Iranians"), and airyanəm vaējō vaŋhuyāfi dāityayāfi ("Iranian stretch of the good Dāityā"). In the late part of the Avesta (Videvdat 1), one of the mentioned homelands was referred to as Airyan'əm Vaējah which approximately means "expanse of the Iranians". The homeland varied in its geographic range, the area around Herat (Pliny's view) and even the entire expanse of the Iranian plateau (Strabo's designation). The Old Persian and Avestan evidence is confirmed by the Greek sources. Herodotus, in his Histories, remarks about the Iranian Medes that "Medes were called anciently by all people Arians" (7.62). In Armenian sources, the Parthians, Medes and Persians are collectively referred to as Iranians. Eudemus of Rhodes (Dubitationes et Solutiones de Primis Principiis, in Platonis Parmenidem) refers to "the Magi and all those of Iranian (áreion) lineage". Diodorus Siculus (1.94.2) considers Zoroaster (Zathraustēs) as one of the Arianoi. The name of Ariana is further extended to a part of Persia and of Media, as also to the Bactrians and Sogdians on the north; for these speak approximately the same language, with but slight variations. The Bactrian (a Middle Iranian language) inscription of Kanishka (the founder of the Kushan Empire) at Rabatak, which was discovered in 1993 in an unexcavated site in the Afghan province of Baghlan, clearly refers to this Eastern Iranian language as Arya. All this evidence shows that the name Arya was a collective definition, denoting peoples who were aware of belonging to the one ethnic stock, speaking a common language, and having a religious tradition that centered on the cult of Ohrmazd. The academic usage of the term Iranian is distinct from the state of Iran and its various citizens (who are all Iranian by nationality), in the same way that the term Germanic peoples is distinct from Germans. Some inhabitants of Iran are not necessarily ethnic Iranians by virtue of not being speakers of Iranian languages. The Andronovo, BMAC and Yaz cultures have been associated with Indo-Iranians. The Proto-Indo-Iranians are commonly identified with the Sintashta culture and the subsequent Andronovo culture within the broader Andronovo horizon, and their homeland with an area of the Eurasian steppe that borders the Ural River on the west, the Tian Shan on the east. The Indo-Iranians interacted with the Bactria-Magiana Culture, also called "Bactria-Magiana Archaeological Complex". Proto-Indo-Iranian arose due to this influence. The Indo-Iranians also borrowed their distinctive religious beliefs and practices from this culture. The Indo-Iranian migrations took place in two waves. The first wave consisted of the Indo-Aryan migration into the Levant, founding the Mittani kingdom, and a migration south-eastward of the Vedic people, over the Hindu Kush into northern India. The Indo-Aryans split-off around 1800–1600 BCE from the Iranians, where-after they were defeated and split into two groups by the Iranians, who dominated the Central Eurasian steppe zone and "chased [the Indo-Aryans] to the extremities of Central Eurasia." One group were the Indo-Aryans who founded the Mitanni kingdom in northern Syria; (c. 1500–1300 BCE) the other group were the Vedic people. Christopher I. Beckwith suggests that the Wusun, an Indo-European Caucasian people of Inner Asia in antiquity, were also of Indo-Aryan origin. The second wave is interpreted as the Iranian wave, and took place in the third stage of the Indo-European migrations from 800 BCE onwards. According to Allentoft (2015), the Sintashta culture probably derived from the Corded Ware Culture. The Sintashta culture, also known as the Sintashta-Petrovka culture or Sintashta-Arkaim culture, is a Bronze Age archaeological culture of the northern Eurasian steppe on the borders of Eastern Europe and Central Asia, dated to the period 2100–1800 BCE. It is probably the archaeological manifestation of the Indo-Iranian language group. The Sintashta culture emerged from the interaction of two antecedent cultures. Its immediate predecessor in the Ural-Tobol steppe was the Poltavka culture, an offshoot of the cattle-herding Yamnaya horizon that moved east into the region between 2800 and 2600 BCE. Several Sintashta towns were built over older Poltovka settlements or close to Poltovka cemeteries, and Poltovka motifs are common on Sintashta pottery. Sintashta material culture also shows the influence of the late Abashevo culture, a collection of Corded Ware settlements in the forest steppe zone north of the Sintashta region that were also predominantly pastoralist. Allentoft et al. (2015) also found close autosomal genetic relationship between peoples of Corded Ware culture and Sintashta culture. The earliest known chariots have been found in Sintashta burials, and the culture is considered a strong candidate for the origin of the technology, which spread throughout the Old World and played an important role in ancient warfare. Sintashta settlements are also remarkable for the intensity of copper mining and bronze metallurgy carried out there, which is unusual for a steppe culture. Because of the difficulty of identifying the remains of Sintashta sites beneath those of later settlements, the culture was only recently distinguished from the Andronovo culture. It is now recognised as a separate entity forming part of the 'Andronovo horizon'. Map of the approximate maximal extent of the Andronovo culture. The formative Sintashta-Petrovka culture is shown in darker red. The location of the earliest spoke-wheeled chariot finds is indicated in purple. Adjacent and overlapping cultures (Afanasevo culture, Srubna culture, BMAC) are shown in green. The geographical extent of the culture is vast and difficult to delineate exactly. On its western fringes, it overlaps with the approximately contemporaneous, but distinct, Srubna culture in the Volga-Ural interfluvial. To the east, it reaches into the Minusinsk depression, with some sites as far west as the southern Ural Mountains, overlapping with the area of the earlier Afanasevo culture. Additional sites are scattered as far south as the Koppet Dag (Turkmenistan), the Pamir (Tajikistan) and the Tian Shan (Kyrgyzstan). The northern boundary vaguely corresponds to the beginning of the Taiga. In the Volga basin, interaction with the Srubna culture was the most intense and prolonged, and Federovo style pottery is found as far west as Volgograd. Most researchers associate the Andronovo horizon with early Indo-Iranian languages, though it may have overlapped the early Uralic-speaking area at its northern fringe. From the late 2nd millennium BCE to early 1st millennium BCE the Iranians had expanded from the Eurasian Steppe, and Iranian peoples such as Medes, Persians, Parthians and Bactrians populated the Iranian plateau. Scythian tribes, along with Cimmerians, Sarmatians and Alans populated the steppes north of the Black Sea. The Scythian and Sarmatian tribes were spread across Great Hungarian Plain, South-Eastern Ukraine, Russias Siberian, Southern, Volga, Uralic regions and the Balkans, while other Scythian tribes, such as the Saka, spread as far east as Xinjiang, China. Scythians as well formed the Indo-Scythian Empire, and Bactrians formed a Greco-Bactrian Kingdom founded by Diodotus I, the satrap of Bactria. The Kushan Empire, with Bactrian roots/connections, once controlled much of Pakistan, Afghanistan, and Tajikistan. The Kushan elite (who the Chinese called the Yuezhi) were an Eastern Iranian language-speaking people. The division into an "Eastern" and a "Western" group by the early 1st millennium is visible in Avestan vs. Old Persian, the two oldest known Iranian languages. The Old Avestan texts known as the Gathas are believed to have been composed by Zoroaster, the founder of Zoroastrianism, with the Yaz culture (c. 1500 BCE – 1100 BCE) as a candidate for the development of Eastern Iranian culture. Geographical extent of Iranian influence in the 1st century BCE. The Parthian Empire (mostly Western Iranian) is shown in red, other areas, dominated by Scythia (Eastern Iranian), in orange. During the 1st centuries of the 1st millennium BCE, the ancient Persians established themselves in the western portion of the Iranian plateau and appear to have interacted considerably with the Elamites and Babylonians, while the Medes also entered in contact with the Assyrians. Remnants of the Median language and Old Persian show their common Proto-Iranian roots, emphasized in Strabo and Herodotus' description of their languages as very similar to the languages spoken by the Bactrians and Sogdians in the east. Following the establishment of the Achaemenid Empire, the Persian language (referred to as "Farsi" in Persian) spread from Pars or Fars Province to various regions of the Empire, with the modern dialects of Iran, Afghanistan (also known as Dari) and Central-Asia (known as Tajiki) descending from Old Persian. Later on, in 550 BCE, Cyrus the Great, would overthrow the leading Median rule, and conquer Kingdom of Lydia and the Babylonian Empire after which he established the Achaemenid Empire (or the First Persian Empire), while his successors would dramatically extend its borders. At its greatest extent, the Achaemenid Empire would encompass swaths of territory across three continents, namely Europe, Africa and Asia, stretching from the Balkans and Eastern Europe proper in the west, to the Indus Valley in the east. The largest empire of ancient history, with their base in Persis (although the main capital was located in Babylon) the Achaemenids would rule much of the known ancient world for centuries. This First Persian Empire was equally notable for its successful model of a centralised, bureaucratic administration (through satraps under a king) and a government working to the profit of its subjects, for building infrastructure such as a postal system and road systems and the use of an official language across its territories and a large professional army and civil services (inspiring similar systems in later empires), and for emancipation of slaves including the Jewish exiles in Babylon, and is noted in Western history as the antagonist of the Greek city states during the Greco-Persian Wars. The Mausoleum at Halicarnassus, one of the Seven Wonders of the Ancient World, was built in the empire as well. The Greco-Persian Wars resulted in the Persians being forced to withdraw from their European territories, setting the direct further course of history of Greece and the rest of Europe. More than a century later, a prince of Macedon (which itself was a subject to Persia from the late 6th century BCE up to the First Persian invasion of Greece) later known by the name of Alexander the Great, overthrew the incumbent Persian king, by which the Achaemenid Empire was ended. Old Persian is attested in the Behistun Inscription (c. 519 BCE), recording a proclamation by Darius the Great. In southwestern Iran, the Achaemenid kings usually wrote their inscriptions in trilingual form (Elamite, Babylonian and Old Persian) while elsewhere other languages were used. The administrative languages were Elamite in the early period, and later Imperial Aramaic, as well as Greek, making it a widely used bureaucratic language. Even though the Achaemenids had extensive contacts with the Greeks and vice versa, and had conquered many of the Greek-speaking area's both in Europe and Asia Minor during different periods of the empire, the native Old Iranian sources provide no indication of Greek linguistic evidence. However, there is plenty of evidence (in addition to the accounts of Herodotus) that Greeks, apart from being deployed and employed in the core regions of the empire, also evidently lived and worked in the heartland of the Achaemenid Empire, namely Iran. For example, Greeks were part of the various ethnicities that constructed Darius' palace in Susa, apart from the Greek inscriptions found nearby there, and one short Persepolis tablet written in Greek. The early inhabitants of the Achaemenid Empire appear to have adopted the religion of Zoroastrianism. The Baloch who speak a west Iranian language relate an oral tradition regarding their migration from Aleppo, Syria around the year 1000 CE, whereas linguistic evidence links Balochi to Kurmanji, Soranî, Gorani and Zazaki language. While the Iranian tribes of the south are better known through their texts and modern counterparts, the tribes which remained largely in the vast Eurasian expanse are known through the references made to them by the ancient Greeks, Persians, Chinese, and Indo-Aryans as well as by archaeological finds. The Greek chronicler, Herodotus (5th century BCE) makes references to a nomadic people, the Scythians; he describes them as having dwelt in what is today southern European Russia and Ukraine. He was the first to make a reference to them. Many ancient Sanskrit texts from a later period make references to such tribes they were witness of pointing them towards the southeastern-most edges of Central Asia, around the Hindukush range in northern Pakistan. It is believed that these Scythians were conquered by their eastern cousins, the Sarmatians, who are mentioned by Strabo as the dominant tribe which controlled the southern Russian steppe in the 1st millennium CE. These Sarmatians were also known to the Romans, who conquered the western tribes in the Balkans and sent Sarmatian conscripts, as part of Roman legions, as far west as Roman Britain. These Iranian-speaking Scythians and Sarmatians dominated large parts of Eastern Europe for a millennium, and were eventually absorbed and assimilated (e.g. Slavicisation) by the Proto-Slavic population of the region. The Sarmatians differed from the Scythians in their veneration of the god of fire rather than god of nature, and women's prominent role in warfare, which possibly served as the inspiration for the Amazons. At their greatest reported extent, around the 1st century CE, these tribes ranged from the Vistula River to the mouth of the Danube and eastward to the Volga, bordering the shores of the Black and Caspian Seas as well as the Caucasus to the south. Their territory, which was known as Sarmatia to Greco-Roman ethnographers, corresponded to the western part of greater Scythia (mostly modern Ukraine and Southern Russia, also to a smaller extent north eastern Balkans around Moldova). According to authors Arrowsmith, Fellowes and Graves Hansard in their book A Grammar of Ancient Geography published in 1832, Sarmatia had two parts, Sarmatia Europea and Sarmatia Asiatica covering a combined area of 503,000 sq mi or 1,302,764 km2. Throughout the 1st millennium CE, the large presence of the Sarmatians who once dominated Ukraine, Southern Russia, and swaths of the Carpathians, gradually started to diminish mainly due to assimilation and absorption by the Germanic Goths, especially from the areas near the Roman frontier, but only completely by the Proto-Slavic peoples. The abundant East Iranian-derived toponyms in Eastern Europe proper (e.g. some of the largest rivers; the Dniestr and Dniepr), as well as loanwords adopted predominantly through the Eastern Slavic languages and adopted aspects of Iranian culture amongst the early Slavs, are all a remnant of this. A connection between Proto-Slavonic and Iranian languages is also furthermore proven by the earliest layer of loanwords in the former. For instance, the Proto-Slavonic words for god (*bogъ), demon (*divъ), house (*xata), axe (*toporъ) and dog (*sobaka) are of Scythian origin. A further point on behalf of the extensive contact between these Scytho-Sarmatian Iranian tribes in Eastern Europe and the (Early) Slavs is to be shown in matters regarding religion. After Slavic and Baltic languages diverged –- also evidenced by etymology –- the Early Slavs interacted with Iranian peoples and merged elements of Iranian spirituality into their beliefs. For example, both Early Iranian and Slavic supreme gods were considered givers of wealth, unlike the supreme thunder gods in many other European religions. Also, both Slavs and Iranians had demons –- given names from similar linguistic roots, Daêva (Iranian) and Divŭ (Slavic) –- and a concept of dualism, of good and evil. The Sarmatians of the east, based in the Pontic–Caspian steppe, became the Alans, who also ventured far and wide, with a branch ending up in Western Europe and then North Africa, as they accompanied the Germanic Vandals and Suebi during their migrations. The modern Ossetians are believed to be the direct descendants of the Alans, as other remnants of the Alans disappeared following Germanic, Hunnic and ultimately Slavic migrations and invasions. Another group of Alans allied with Goths to defeat the Romans and ultimately settled in what is now called Catalonia (Goth-Alania). Some of the Saka-Scythian tribes in Central Asia would later move further southeast and invade the Iranian plateau, large sections of present-day Afghanistan and finally deep into present day Pakistan (see Indo-Scythians). Another Iranian tribe related to the Saka-Scythians were the Parni in Central Asia, and who later become indistinguishable from the Parthians, speakers of a northwest-Iranian language. Many Iranian tribes, including the Khwarazmians, Massagetae and Sogdians, were assimilated and/or displaced in Central Asia by the migrations of Turkic tribes emanating out of Xinjiang and Siberia. The most dominant surviving Eastern Iranian peoples are represented by the Pashtuns, whose origins are generally believed to be from the province of Ghor, from which they began to spread until they reached as far west as Herat, north to areas of southern and eastern Afghanistan; and as eastward towards the Indus. The Pashto language shows affinities to the Avestan and Bactrian. The modern Sarikoli in southern Xinjiang and the Ossetians of the Caucasus (mainly South Ossetia and North Ossetia) are remnants of the various Scythian-derived tribes from the vast far and wide territory they once dwelled in. The modern Ossetians are the descendants of the Alano-Sarmatians, and their claims are supported by their Northeast Iranian language, while culturally the Ossetians resemble their North Caucasian neighbors, the Kabardians and Circassians. Various extinct Iranian peoples existed in the eastern Caucasus, including the Azaris, while some Iranian peoples remain in the region, including the Talysh and the Tats (including the Judeo-Tats, who have relocated to Israel), found in Azerbaijan and as far north as the Russian republic of Dagestan. A remnant of the Sogdians is found in the Yaghnobi-speaking population in parts of the Zeravshan valley in Tajikistan. Starting with the reign of Omar in 634 CE, Muslim Arabs began a conquest of the Iranian plateau. The Arabs conquered the Sassanid Empire of the Persians and seized much of the Byzantine Empire populated by the Kurds and others. Ultimately, the various Iranian peoples, including the Persians, Pashtuns, Kurds and Balochis, converted to Islam, while the Alans converted to Christianity, thus laying the foundation for the fact that the modern-day Ossetians are Christian. The Iranian peoples would later split along sectarian lines as the Persians adopted the Shi'a sect. As ancient tribes and identities changed, so did the Iranian peoples, many of whom assimilated foreign cultures and peoples. Later, during the 2nd millennium CE, the Iranian peoples would play a prominent role during the age of Islamic expansion and empire. Saladin, a noted adversary of the Crusaders, was an ethnic Kurd, while various empires centered in Iran (including the Safavids) re-established a modern dialect of Persian as the official language spoken throughout much of what is today Iran and the Caucasus. Iranian influence spread to the neighbouring Ottoman Empire, where Persian was often spoken at court (though a heavy Turko-Persian basis there was set already by the predecessors of the Ottomans in Anatolia, namely the Seljuks and the Sultanate of Rum amongst others) as well to the court of the Mughal Empire. All of the major Iranian peoples reasserted their use of Iranian languages following the decline of Arab rule, but would not begin to form modern national identities until the 19th and early 20th centuries (just as Germans and Italians were beginning to formulate national identities of their own). There are an estimated 150 to 200 million native speakers of Iranian languages, the six major groups of Persians, Lurs, Kurds, Tajiks, Baloch, and Pashtuns accounting for about 90% of this number. Currently, most of these Iranian peoples live in Iran, Afghanistan, the Caucasus (mainly Ossetia, other parts of Georgia, Dagestan, and Azerbaijan), Iraqi Kurdistan and Kurdish majority populated areas of Turkey, Iran and Syria, Tajikistan, Pakistan and Uzbekistan. There are also Iranian peoples living in Eastern Arabia such as northern Oman and Bahrain. Due to recent migrations, there are also large communities of speakers of Iranian languages in Europe, the Americas, and Israel. Nowruz, an ancient Iranian annual festival that is still widely celebrated throughout the Iranian Plateau and beyond, in Dushanbe, Tajikistan. Iranian culture is today considered to be centered in what is called the Iranian Plateau, and has its origins tracing back to the Andronovo culture of the late Bronze Age, which is associated with other cultures of the Eurasian Steppe. It was, however, later developed distinguishably from its earlier generations in the Steppe, where a large number of Iranian-speaking peoples (i.e., the Scythians) continued to participate, resulting in a differentiation that is displayed in Iranian mythology as the contrast between Iran and Turan. Like other Indo-Europeans, the early Iranians practiced ritual sacrifice, had a social hierarchy consisting of warriors, clerics, and farmers, and recounted their deeds through poetic hymns and sagas. Various common traits can be discerned among the Iranian peoples. For instance, the social event of Nowruz is an ancient Iranian festival that is still celebrated by nearly all of the Iranian peoples. However, due to their different environmental adaptations through migration, the Iranian peoples embrace some degrees of diversity in dialect, social system, and other aspects of culture. With numerous artistic, scientific, architectural, and philosophical achievements and numerous kingdoms and empires that bridged much of the civilized world in antiquity, the Iranian peoples were often in close contact with people from various western and eastern parts of the world. The ruins at Kangavar, Iran, presumed to belong to a temple dedicated to the ancient goddess Anahita. The early Iranian peoples practiced the ancient Iranian religion, which, like that of other Indo-European peoples, embraced various male and female deities. Fire was regarded as an important and highly sacred element, and also a deity. In ancient Iran, fire was kept with great care in fire temples. Various annual festivals that were mainly related to agriculture and herding were celebrated, the most important of which was the New Year (Nowruz), which is still widely celebrated. Zoroastrianism, a form of the ancient Iranian religion that is still practiced by some communities, was later developed and spread to nearly all of the Iranian peoples living in the Iranian Plateau. Other religions that had their origins in the Iranian world were Mithraism, Manichaeism, and Mazdakism, among others. The various religions of the Iranian peoples are believed by some scholars to have been significant early philosophical influences on Christianity and Judaism. Modern speakers of the Iranian languages are primarily adherents of Islam, with most Kurds, Tajiks, Pashtuns and Baloch following Sunnism; the Zazas split between Sunni and Alevism; most Pamiris following Nizari Isma'ilism; and most Persians in Iran following Twelverism. Some Iranian-speakers are adherents of Christianity, with most Ossetians following Russian Orthodoxy, and others following the Armenian Apostolic Church and Nestorianism. Some are adherents of Zoroastrianism, Baha'ism, various folk religions, with an unknown number showing no religious affiliation. Iranian languages were and, to a lesser extent, still are spoken in a wide area comprising regions around the Black Sea, the Caucasus, Central Asia, Russia and the northwest of China. As late as the 13th century, when Turkic and Mongol armies finally conquered the entire region, the majority of the population of Central Asia were Iranian. This population was linguistically assimilated by smaller but dominant Turkic-speaking groups, while the sedentary population eventually adopted the Persian language, which began to spread within the region since the time of the Sasanian Empire. The language-shift from Middle Iranian to Turkic and New Persian was predominantly the result of an "elite dominance" process. Moreover, various Turkic-speaking ethnic groups of the Iranian Plateau are often conversant also in an Iranian language and embrace Iranian culture to the extent that the term Turko-Iranian would be applied. A number of Iranian peoples were also intermixed with the Slavs, and many were subjected to Slavicisation. The following either partially descend from or are sometimes regarded as descendants of the Iranian peoples. Turkmens: Genetic studies show that the Turkmens are characterized by the presence of local Iranian mtDNA lineages, similar to the eastern Iranian populations, but high male Mongoloid genetic components were observed in Turkmen populations with the frequencies of about 20%. This likely indicates an ancestral combination of Turkic and Iranian groups that the modern Turkmens have inherited, apparently corresponding to the historical record that indicates the presence of various Iranian tribes in the region prior to the migration of Turkic tribes. Uzbeks: The unique grammatical and phonetical features of the Uzbek language, as well as elements within the modern Uzbek culture, reflect the older Iranian roots of the Uzbek people. According to recent genetic genealogy testing from a University of Oxford study, the genetic admixture of the Uzbeks clusters somewhere between the Iranian peoples and the Mongols. Prior to the Russian conquest of Central Asia, the local ancestors of the Turkic-speaking Uzbeks and the Iranian-speaking Tajiks, both living in Central Asia, were referred to as Sarts, while Uzbek and Turk were the names given to the nomadic and semi-nomadic populations of the area. Still, as of today, modern Uzbeks and Tajiks are known to their Turkic neighbors, the Kazakhs and the Kyrgyz, as Sarts. Some Uzbek scholars also favor the Iranian origin theory. Uyghurs: Contemporary scholars consider modern Uyghurs to be the descendants of, apart from the ancient Uyghurs, the Iranian Saka (Schytian) tribes and other Indo-European peoples who inhabited the Tarim Basin before the arrival of the Turkic tribes. Shirazis: The Shirazi are a sub-group of the Swahili people living on the Swahili coast of East Africa, especially on the islands of Zanzibar, Pemba, and Comoros. Local traditions about their origin claim they are descended from merchant princes from Shiraz in Iran who settled along the Swahili coast. J1-M267; typical of Semitic-speaking people, was rarely over 10% in Iranian groups, but as high as 30% in Assyrian minorities of Iran..
J2-M172: is the most common Hg in Iran (~23%); almost exclusively represented by J2a-M410 subclade (93%), the other major sub-clade being J2b-M12. Apart from Iranians, J2 is common in Arabs, Mediterranean and Balkan peoples (Croats, Serbs, Greeks, Bosniaks, Albanians, Italians, Bulgarians, Turks), in the Caucasus (Armenians, Georgia, northeastern Turkey, north/northwestern Iran, Kurds, Persians); whilst its frequency drops suddenly beyond Afghanistan, Pakistan and northern India. In Europe, J2a is more common in the southern Greece and southern Italy; whilst J2b (J2-M12) is more common in Thessaly, Macedonia and central – northern Italy. Thus J2a and its subgroups within it have a wide distribution from Italy to India, whilst J2b is mostly confined to the Balkans and Italy, being rare even in Turkey. Whilst closely linked with Anatolia and the Levant; and putative agricultural expansions, the distribution of the various sub-clades of J2 likely represents a number of migrational histories which require further elucidation. R1a-M198: is common in Iran, more so in the east and south rather than the west and north; suggesting a migration toward the south to India then a secondary westward spread across Iran. Whilst the Grongi and Regueiro studies did not define exactly which sub-clades Iranian R1a haplogrouops belong to, private genealogy tests suggest that they virtually all belong to "Eurasian" R1a-Z93. Indeed, population studies of neighbouring Indian groups found that they all were in R1a-Z93. This implies that R1a in Iran did not descend from "European" R1a, or vice versa. Rather, both groups are collateral, sister branches which descend from a parental group hypothesized to have initially lived somewhere between central Asia and Eastern Europe. R1b – M269: is widespread from Ireland to Iran, and is common in highland West Asian populations such as Armenians, Turks and Iranians – with an average frequency of 8.5%. Iranian R1b belongs to the L-23 subclade, which is an older than the derivative subclade (R1b-M412) which is most common in western Europe. Haplogroup G and subclades: most concentrated in the southern Caucasus, it is present in 10% of Iranians. Haplogroup E and various subclades are markers of various northern and eastern African populations. They are present in less than 10% of Iranians (see Afro-Iranians). R1a (subclade not further analyzed) was the predominant haplogroup, especially amongst Pashtuns, Balochi and Tajiks. The presence of "east Eurasian" haplogroup C3, especially in Hazaras (33–40%), in part linked to Mongol expansions into the region. The presence of haplogroup J2, like in Iran, of 5–20%. A relative paucity of "Indian" haplgroup H (< 10%). Overall, Iranian-speaking populations are characterized by high internal diversity. For Afghanistan, "It is possibly due to the strategic location of this region and its unique harsh geography of mountains, deserts and steppes, which could have facilitated the establishment of social organizations within expanding populations, and helped maintaining genetic boundaries among groups that have developed over time into distinct ethnicities" as well as the "high level of endogamy practiced by these groups". The data ultimately suggests that Afghanistan, like other northern-central Asian regions, has continually been the recipient rather than a source of gene flow. Although, populations from Iran proper are also diverse, J2a-M530 likely spread out of Iran, and constitutes a common genetic substratum for all Iranian populations, which was then modified by further differential gene flows. In Iran, language was a greater determinant of genetic similarity between different groups, whereas in Afghanistan and other areas of northern central Asia, this was not the case. Overall in Iran, native population groups do not form tight clusters either according to language or region. Rather, they occupy intermediate positions among Near Eastern and Caucasus clusters. Some of the Iranian groups lie within the Near Eastern group (often with such as the Turks and Georgians), but none fell into the Arab or Asian groups. Some Iranian groups in Iran, such as the Gilakis and Mazandaranis, have paternal genetics (Y-DNA) virtually identical to South Caucasus ethnic groups. In Afghanistan, Iranian population groups such as the Pashtuns and Tajiks occupy intermediate positions amongst northwestern South Asian ethnic groups, such as along the Baloch, Brahui, Kashmiris and Sindhis, with a small minor pull towards West Asia. Iranians are only distantly related to Europeans as a whole, predominantly with southern Europeans like Greeks, Albanians, Serbs, Croatians, Italians, Bosniaks, Spaniards, Macedonians, Portuguese, and Bulgarians, rather than northern Europeans like Norwegians, Danes, Swedes, Irish, Scottish, Welsh, English, Finns, Estonians, Latvians, and Lithuanians. Nevertheless, Iranian-speaking Central Asians do show closer affinity to Europeans than do Turkic-speaking Central Asians. ^ In the Avesta the airiia- are members of the ethnic group of the Avesta-reciters themselves, in contradistinction to the anairiia-, the "non-Aryas". The word also appears four times in Old Persian: One is in the Behistun inscription, where ariya- is the name of a language or script (DB 4.89). The other three instances occur in Darius I's inscription at Naqsh-e Rustam (DNa 14–15), in Darius I's inscription at Susa (DSe 13–14), and in the inscription of Xerxes I at Persepolis (XPh 12–13). In these, the two Achaemenid dynasts describe themselves as pārsa pārsahyā puça ariya ariyaciça "a Persian, son of a Persian, an Ariya, of Ariya origin." "The phrase with ciça, “origin, descendance”, assures that it [i.e. ariya] is an ethnic name wider in meaning than pārsa and not a simple adjectival epithet". ^ a b c Frye, R. N. "IRAN v. PEOPLES OF IRAN (1) A General Survey". Encyclopædia Iranica. XIII. pp. 321–326. Retrieved 30 December 2012. ^ The Encyclopedia Americana. 15. 1954. p. 306. ^ Izady, Mehrdad R. (1992). The Kurds: A Concise Handbook. Taylor & Francis. ISBN 978-0-8448-1727-9. ^ "IRAN vi. IRANIAN LANGUAGES AND SCRIPTS". Encyclopædia Iranica. XIII. 29 March 2012. pp. 344–377. ^ Harmatta 1992, p. 348: "From the first millennium b.c., we have abundant historical, archaeological and linguistic sources for the location of the territory inhabited by the Iranian peoples. In this period the territory of the northern Iranians, they being equestrian nomads, extended over the whole zone of the steppes and the wooded steppes and even the semi-deserts from the Great Hungarian Plain to the Ordos in northern China." ^ a b Brzezinski, Richard; Mielczarek, Mariusz (2002). The Sarmatians, 600 BC-AD 450. Osprey Publishing. p. 39. (...) Indeed, it is now accepted that the Sarmatians merged in with pre-Slavic populations. ^ a b c Adams, Douglas Q. (1997). Encyclopedia of Indo-European Culture. Taylor & Francis. p. 523. (...) In their Ukrainian and Polish homeland the Slavs were intermixed and at times overlain by Germanic speakers (the Goths) and by Iranian speakers (Scythians, Sarmatians, Alans) in a shifting array of tribal and national configurations. ^ a b Atkinson, Dorothy; et al. (1977). Women in Russia. Stanford University Press. p. 3. (...) Ancient accounts link the Amazons with the Scythians and the Sarmatians, who successively dominated the south of Russia for a millennium extending back to the seventh century B.C. The descendants of these peoples were absorbed by the Slavs who came to be known as Russians. ^ a b c Slovene Studies. 9–11. Society for Slovene Studies. 1987. p. 36. (...) For example, the ancient Scythians, Sarmatians (amongst others), and many other attested but now extinct peoples were assimilated in the course of history by Proto-Slavs. ^ Roy, Olivier (2007). The New Central Asia: Geopolitics and the Birth of Nations. I.B. Tauris. p. 6. ISBN 978-1-84511-552-4. The mass of the Oghuz who crossed the Amu Darya towards the west left the Iranian plateaux, which remained Persian, and established themselves more to the west, in Anatolia. Here they divided into Ottomans, who were Sunni and settled, and Turkmens, who were nomads and in part Shiite (or, rather, Alevi). The latter were to keep the name 'Turkmen' for a long time: from the thirteenth century onwards they 'Turkised' the Iranian populations of Azerbaijan (who spoke west Iranian languages such as Tat, which is still found in residual forms), thus creating a new identity based on Shiism and the use of Turkish. These are the people today known as Azeris. ^ Yarshater, Ehsan (15 December 1988). "AZERBAIJAN vii. The Iranian Language of Azerbaijan". Encyclopædia Iranica. ^ Emmerick, Ronald Eric (23 February 2016). "Iranian languages". Encyclopædia Britannica. Retrieved 9 September 2018. ^ Frye, Richard Nelson (2005). Greater Iran. p. xi. ISBN 978-1-56859-177-3. (...) Iran means all lands and people where Iranian languages were and are spoken, and where in the past, multi-faceted Iranian cultures existed. ^ a b c MacKenzie, David Niel (1998). "Ērān, Ērānšahr". Encyclopedia Iranica. 8. Costa Mesa: Mazda. ^ Laroche. 1957. Proto-Iranian *arya- descends from Proto-Indo-European (PIE) *ar-yo-, a yo-adjective to a root *ar "to assemble skillfully", present in Greek harma "chariot", Greek aristos, (as in "aristocracy"), Latin ars "art", etc. ^ G. Gnoli, "Iranian Identity as a Historical Problem: the Beginnings of a National Awareness under the Achaemenians," in The East and the Meaning of History. International Conference (23–27 November 1992), Roma, 1994, pp. 147–67. ^ a b c d e f g h Gnoli, G. "Iranian Identity ii. Pre-Islamic Period". Encyclopedia Iranica. Retrieved 3 February 2019. ^ a b c H. W. Bailey, "Arya" in Encyclopedia Iranica. Excerpt: "ARYA an ethnic epithet in the Achaemenid inscriptions and in the Zoroastrian Avestan tradition. "Arya an ethnic epithet in the Achaemenid inscriptions and in the Zoroastrian Avestan tradition". Archived from the original on 3 January 2013. Also accessed online in May, 2010. ^ G. Gnoli. "ēr, ēr mazdēsn". Encyclopedia Iranica. ^ a b Bailey, Harold Walter (1987). "Arya". Encyclopedia Iranica. 2. New York: Routledge & Kegan Paul. pp. 681–683. ^ cf. Gershevitch, Ilya (1968). "Old Iranian Literature". Handbuch der Orientalistik, Literatur I. Leiden: Brill. pp. 1–31. , p. 2. ^ a b c R. G. Kent. Old Persian. Grammar, texts, lexicon. 2nd ed., New Haven, Conn.
^ Professor Gilbert Lazard: The language known as New Persian, which usually is called at this period (early Islamic times) by the name of Dari or Parsi-Dari, can be classified linguistically as a continuation of Middle Persian, the official religious and literary language of Sassanian Iran, itself a continuation of Old Persian, the language of the Achaemenids. Unlike the other languages and dialects, ancient and modern, of the Iranian group such as Avestan, Parthian, Soghdian, Kurdish, Ossetian, Balochi, Pashto, Armenian etc., Old Middle and New Persian represent one and the same language at three states of its history. It had its origin in Fars (the true Persian country from the historical point of view) and is differentiated by dialectical features, still easily recognizable from the dialect prevailing in north-western and eastern Iran in Lazard, Gilbert 1975, "The Rise of the New Persian Language" in Frye, R. N., The Cambridge History of Iran, Vol. 4, pp. 595–632, Cambridge: Cambridge University Press. ^ a b Meyer, Eduard (1911). "Iran" . In Chisholm, Hugh (ed.). Encyclopædia Britannica. 742 (11th ed.). Cambridge University Press. p. 742. ^ a b Beckwith 2009. ^ Anthony 2007, p. 408. ^ Beckwith 2009, p. 33 note 20, p.35. ^ a b Beckwith 2009, p. 33. ^ Beckwith 2009, p. 33 note 20. ^ Beckwith 2009, p. 376-7. ^ Malory 1989, pp. 42–43. ^ a b Koryakova 1998b. ^ a b Koryakova 1998a. ^ Anthony 2009, p. 390 (fig. 15.9), 405–411. ^ Anthony 2007, pp. 385–388. ^ Allentoft; Sikora; et al. (2015). "Population genomics of Bronze Age Eurasia". Nature. 522 (7555): 167–172. doi:10.1038/nature14507. PMID 26062507. ^ Hanks & Linduff 2009. ^ Mallory 1997, pp. 20–21. ^ Diakonoff 1995, p. 473. ^ "Amazons in the Scythia: new finds at the Middle Don, Southern Russia". Taylorandfrancis.metapress.com. Retrieved 21 June 2009. ^ "Secrets of the Dead, Casefile: Amazon Warrior Women". Pbs.org. Retrieved 21 June 2009. ^ Tim McNeese (November 2004). The Volga River. p. 14. ISBN 9780791082478. Retrieved 11 July 2018. ^ Liverani, M. (1995). "The Medes at Esarhaddon's Court". Journal of Cuneiform Studies. 47: 57–62. doi:10.2307/1359815. JSTOR 1359815. ^ "The Geography of Strabo" — University of Chicago. . Retrieved 4 June 2006. ^ "Avestan xᵛarǝnah-, etymology and concept by Alexander Lubotsky" Archived 7 February 2006 at the Wayback Machine — Sprache und Kultur. Akten der X. Fachtagung der Indogermanischen Gesellschaft, 22.-28. September 1996, ed. W. Meid, Innsbruck (IBS) 1998, 479–488. . Retrieved 4 June 2006. ^ R. G. Kent, Old Persian: Grammar, texts and lexicon. ^ R. Hallock (1969), Persepolis Fortification Tablets; A. L. Driver (1954), Aramaic Documents of the V Century BC. ^ a b c d Greek and Iranian, E. Tucker, A History of Ancient Greek: From the Beginnings to Late Antiquity, ed. Anastasios-Phoivos Christidēs, Maria Arapopoulou, Maria Chritē, (Cambridge University Press, 2001), 780. ^ "Kurdish: An Indo-European Language By Siamak Rezaei Durroei" Archived 17 June 2006 at the Wayback Machine — University of Edinburgh, School of Informatics. . Retrieved 4 June 2006. ^ "The Iranian Language Family, Khodadad Rezakhani" Archived 9 October 2004 at the Wayback Machine — Iranologie. . Retrieved 4 June 2006. ^ "Sarmatian". Encyclopædia Britannica Online. Retrieved 31 December 2014. ^ Apollonius (Argonautica, iii) envisaged the Sauromatai as the bitter foe of King Aietes of Colchis (modern Georgia). ^ Arrowsmith, A; Fellowes, B; Hansard, G L (1832). A Grammar of Ancient Geography,: Compiled for the Use of King's College School (3 April 2006 ed.). Hansard London. p. 9. Retrieved 20 August 2014. ^ Arrowsmith, A; Fellowes, B; Hansard, G L (1832). A Grammar of Ancient Geography,: Compiled for the Use of King's College School (3 April 2006 ed.). Hansard London. p. 15. Retrieved 20 August 2014. ^ a b A History of Russia by Nicholas Riasanovsky, pp. 11–18, Russia before the Russians, ISBN 0-19-515394-4 . Retrieved 4 June 2006. ^ "Jeannine Davis-Kimball, Archaeologist" — Thirteen WNET New York. . Retrieved 4 June 2006. ^ James Minahan, "One Europe, Many Nations", Published by Greenwood Publishing Group, 2000. pg 518: "The Ossetians, calling themselves Iristi and their homeland Iryston are the most northerly Iranian people. ... They are descended from a division of Sarmatians, the Alans who were pushed out of the Terek River lowlands and in the Caucasus foothills by invading Huns in the 4th century CE. ^ "Ossetians". Encarta. Microsoft Corporation. 2008. ^ From Scythia to Camelot by Littleton and Malcor, pp. 40–43, ISBN 0-8153-3566-0 . Retrieved 4 June 2006. ^ "Report for Talysh" — Ethnologue. Retrieved 4 June 2006. ^ "Report for Tats" — Ethnologue. . Retrieved 4 June 2006. ^ "Report for Judeo-Tats" — Ethnologue. . Retrieved 4 June 2006. ^ Gordon, Raymond G., Jr. (2005). "Report for Iranian languages". Ethnologue: Languages of the World (Fifteenth ed.). ^ a b Hamzehʼee, M. Reza. The Yaresan: a sociological, historical and religio-historical study of a Kurdish community, 1990. ^ Nasidze, Ivan; Quinque, Dominique; Ozturk, Murat; Bendukidze, Nina; Stoneking, Mark (1 July 2005). "MtDNA and Y-chromosome Variation in Kurdish Groups". Ann. Hum. Genet. 69 (4): 401–412. doi:10.1046/j.1529-8817.2005.00174.x. PMID 15996169. ^ Kaya, Mehmed S. (15 June 2011). The Zaza Kurds of Turkey: A Middle Eastern Minority in a Globalised Society. I.B.Tauris. ISBN 978-1845118754. ^ J.E. Peterson. "Oman's Diverse Society" (PDF). p. 4. ^ a b c Planhol, Xavier de. "IRAN i. LANDS OF IRAN". Encyclopædia Iranica. XIII. pp. 204–212. Retrieved 30 December 2012. ^ Planhol, Xavier de (7 February 2012). "Evolution of geographical knowledge". Encyclopædia Iranica. X. pp. 426–431. ^ Mallory, J.P. In Search of the Indo-Europeans. pp. 112–127. ISBN 978-0-500-27616-7. ^ Kleiss, Wolfram (20 April 2012). "KANGAVAR – Encyclopaedia Iranica". Encyclopædia Iranica. XV. pp. 496–497. ^ a b c Malandra, William W. "Ancient Iranian religion". Encyclopædia Britannica. Retrieved 4 September 2018. ^ Duchesne-Guillemin, Jacques. "Zoroastrianism". Encyclopædia Britannica. Retrieved 4 September 2018. ^ Runciman, Steven (1982). The Medieval Manichee: A Study of the Christian Dualist Heresy. Cambridge University Press. ISBN 978-0-521-28926-9. ^ a b c Steblin-Kamenskij, Ivan M. (30 December 2012). "CENTRAL ASIA xiii. Iranian Languages". Encyclopædia Iranica. V. pp. 223–226. ^ "Irano-Turkish Relations in the Late Sasanian Period". The Cambridge History of Iran. III/1. Cambridge: Cambridge University Press. 1983. pp. 613–24. 0-521-24693-8. ^ Nauta, A.H. (1972). "Der Lautwandel von a > o and von a > ä in der özbekischen Schriftsprache". Central Asiatic Journal (16): 104–18. ^ Raun, A. (1969). Basic course in Uzbek. Bloomington. ^ Canfield, Robert L. (2002). Turko-Persia in Historical Perspective. Cambridge University Press. ISBN 978-0-521-52291-5. ^ Minorsky, V. "Azerbaijan". In Bearman, P.; Bianquis, Th. ; Bosworth, C.E. ; Donzel, E. van; Heinrichs, W.P. (eds.). Encyclopaedia of Islam. Brill. ^ Roy, Olivier (2007). The new Central Asia. I.B. Tauris. p. 6. ISBN 978-1-84511-552-4. The mass of the Oghuz who crossed the Amu Darya towards the west left the Iranian plateaux, which remained Persian, and established themselves more to the west, in Anatolia. Here they divided into Ottomans, who were Sunni and settled, and Turkmens, who were nomads and in part Shiite (or, rather, Alevi). The latter were to keep the name 'Turkmen' for a long time: from the 13th century onwards they 'Turkised' the Iranian populations of Azerbaijan (who spoke west Iranian languages such as Tat, which is still found in residual forms), thus creating a new identity based on Shiism and the use of Turkish. These are the people today known as Azeris. ^ Yarshater, Ehsan (15 December 1988). "AZERBAIJAN vii. The Iranian Language of Azerbaijan". Encyclopædia Iranica. Retrieved 3 May 2015. ^ "Azerbaijani". Encyclopaedia Britannica. Retrieved 7 September 2018. ^ Yarshater, Ehsan (18 August 2011). "AZERBAIJAN vii. The Iranian Language of Azerbaijan". Encyclopædia Iranica. III. pp. 238–245. ^ "The Columbia Encyclopedia: Azerbaijan". Archived from the original on 17 May 2006. ^ Farjadian, S.; Ghaderi, A. (4 October 2007). "HLA class II similarities in Iranian Kurds and Azeris". International Journal of Immunogenetics. 34 (6): 457–463. doi:10.1111/j.1744-313x.2007.00723.x. ISSN 1744-3121. PMID 18001303. ^ Malyarchuk, B. A.; Derenko, M. V.; Denisova, G. A.; Nassiri, M. R.; Rogaev, E. I. (1 April 2002). "Mitochondrial DNA Polymorphism in Populations of the Caspian Region and Southeastern Europe". Russian Journal of Genetics. 38 (4): 434–438. doi:10.1023/A:1015262522048. Archived from the original on 6 June 2011. ^ Gabain, A. von (1945). Özbekische Grammatik. Leipzig and Vienna. ^ Bečka, J. "Tajik Literature from the 16th Century to the Present". In Rypka, J. (ed.). History of Iranian Literature. pp. 520–605. ^ Jung, A. (1983). Quellen der klassischen Musiktradition Mittelasiens: Die usbekisch-tadshikischen maqom-Zyklen und ihre Beziehung zu anderen regionalen maqam-Traditionen im Vorderen and Mittleren Orient (Ph.D.). Berlin. ^ Levin, T. (1984). The Music and Tradition of the Bukharan Shashmaqam in Soviet Uzbekistan (Ph.D.). Princeton. ^ Tatjana Zerjal; et al. (2002). "A Genetic Landscape Reshaped by Recent Events: Y-Chromosomal Insights into Central Asia". The American Journal of Human Genetics. 71 (3): 466–482. doi:10.1086/342096. PMC 419996. PMID 12145751. ^ Askarov, A.; Ahmadov, B. (20 January 1994). O'zbek Xalqning Kilib Chiqishi Torixi. O'zbekiston Ovozi. ^ Millward, James A.; Perdue, Peter C. (2004). "Chapter 2: Political and Cultural History of the Xinjiang Region through the Late Nineteenth Century". In Starr, S. Frederick (ed.). Xinjiang: China's Muslim Borderland. M.E. Sharpe. pp. 40–41. ISBN 978-0-7656-1318-9. ^ Milanović, Miodrag (2008). Srpski stari vek. Beograd. p. 81. ^ Stagličić, Ivan (27 November 2008). "Ideja o iranskom podrijetlu traje preko dvjesto godina" ["Idea about Iranian theory lasts over two hundred years"]. Zadarski list (in Croatian). Zadar. Retrieved 15 March 2015. ^ Regueiro; et al. (2006). "Iran: Tricontinental Nexus for Y-Chromosome Driven Migration". Hum Hered. 61 (3): 132–143. doi:10.1159/000093774. PMID 16770078. ^ Grugni (2012). "Ancient Migratory Events in the Middle East: New Clues from the Y-Chromosome Variation of Modern Iranians". PLOS ONE. 7 (7): e41252. doi:10.1371/journal.pone.0041252. PMC 3399854. PMID 22815981. ^ Cinnioglu et al. Excavating Y-chromosome haplotype strata in Anatolia" Hum Genet 2004 Jan;114(2):127-48. Epub 2003 Oct 29. ^ Semino, Ornella; et al. (May 2004). "Origin, Diffusion, and Differentiation of Y-Chromosome Haplogroups E and J: Inferences on the Neolithization of Europe and Later Migratory Events in the Mediterranean Area". American Journal of Human Genetics. 74 (5): 1023–1034. doi:10.1086/386295. PMC 1181965. PMID 15069642. ^ "Family Tree DNA – Genetic Testing for Ancestry, Family History & Genealogy". ^ Pamjav; 2012. "Inner and Central Asia is an overlap zone for the R1a1-Z280 and R1a1-Z93 lineages. This pattern implies that an early differentiation zone of R1a1-M198 conceivably occurred somewhere within the Eurasian Steppes or the Middle East and Caucasus region as they lie between South Asia and Eastern Europe"
^ Myres; et al. (2011). "A major Y-chromosome haplogroup R1b Holocene era founder effect in Central and Western Europe". European Journal of Human Genetics. 19 (1): 95–101. doi:10.1038/ejhg.2010.146. PMC 3039512. PMID 20736979. ^ Rootsi; et al. (2012). "Distinguishing the co-ancestries of haplogroup G Y-chromosomes in the populations of Europe and the Caucasus". European Journal of Human Genetics. 20 (12): 1275–1282. doi:10.1038/ejhg.2012.86. PMC 3499744. PMID 22588667. ^ "West Asian clusters compared with Europe and Asia". Retrieved 19 April 2014. ^ "West Asian and European clusters, PCA plot". Retrieved 19 April 2014. ^ "Concomitant Replacement of Language and mtDNA in South Caspian Populations of Iran". Retrieved 19 April 2014. 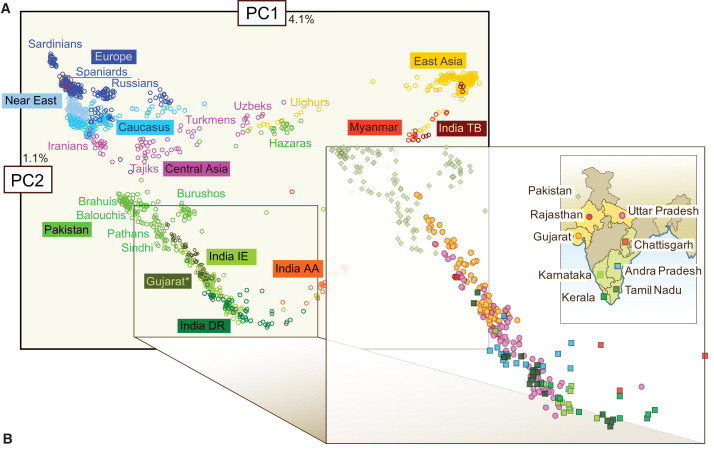 ^ "PCA plot West Asian_European_South Asian populations". Retrieved 19 April 2014. 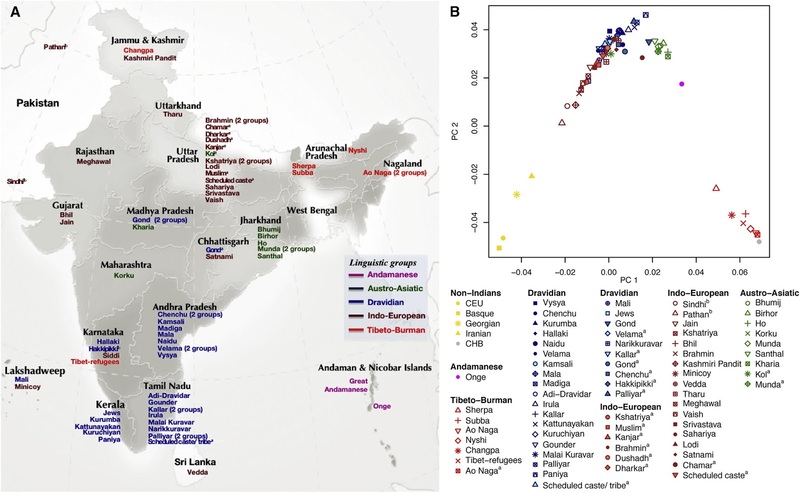 ^ "Major admixture in India took place ~4.2–1.9 thousand years ago (Moorjani et al. 2013)". Retrieved 19 April 2014. ^ Grugni (2012)p="Iranian groups do not cluster all together, occupying intermediate positions among Arab, Near Eastern and Asian clusters"
^ Grugni, Viola; Battaglia, Vincenza; Kashani, Baharak Hooshiar; Parolo, Silvia; Al-Zahery, Nadia; Achilli, Alessandro; Olivieri, Anna; Gandini, Francesca; Houshmand, Massoud; Sanati, Mohammad Hossein; Torroni, Antonio; Semino, Ornella (18 July 2012). "Ancient Migratory Events in the Middle East: New Clues from the Y-Chromosome Variation of Modern Iranians". PLOS ONE. 7 (7): e41252. doi:10.1371/journal.pone.0041252. PMC 3399854. PMID 22815981. Anthony, David W. (2007). The Horse, The Wheel, and Language: How Bronze-Age Riders From the Eurasian Steppes Shaped The Modern World. Princeton University Press. Beckwith, Christopher I. (16 March 2009). Empires of the Silk Road: A History of Central Eurasia from the Bronze Age to the Present. Princeton University Press. ISBN 978-0691135892. Retrieved 29 May 2015. Harmatta, János (1992). "The Emergence of the Indo-Iranians: The Indo-Iranian Languages" (PDF). In Dani, A. H.; Masson, V. M. (eds.). History of Civilizations of Central Asia: The Dawn of Civilization: Earliest Times to 700 B. C. UNESCO. pp. 346–370. ISBN 978-92-3-102719-2. Retrieved 29 May 2015. Mallory, J. P. (1997). Encyclopedia of Indo-European Culture. Taylor & Francis. ISBN 978-1884964985. Retrieved 15 February 2015. Iran Nama, (Iran Travelogue in Urdu) by Hakim Syed Zillur Rahman, Tibbi Academy, Aligarh, India (1998). Chopra, R. M.,"Indo-Iranian Cultural Relations Through The Ages", Iran Society, Kolkata, 2005. Waldman, Carl; Mason, Catherine (2006). Encyclopedia of European Peoples. Infobase Publishing. ISBN 978-1438129181. Retrieved 16 January 2015. Kuzʹmina, Elena Efimovna (2007). The Origin of the Indo-Iranians. BRILL. ""IRAN v. PEOPLES OF IRAN (2) Pre-Islamic"". C. J. Brunner. Encyclopaedia Iranica. "Deep Phylogenetic Analysis of Haplogroup G1 Provides Estimates of SNP and STR Mutation Rates on the Human Y-Chromosome and Reveals Migrations of Iranic Speakers". Oleg Balanovsky, Maxat Zhabagin, Anastasiya Agdzhoyan, Marina Chukhryaeva, Valery Zaporozhchenko, Olga Utevska, Gareth Highnam, Zhaxylyk Sabitov, Elliott Greenspan, Khadizhat Dibirova, Roza Skhalyakho, Marina Kuznetsova, Sergey Koshel, Yuldash Yusupov, Pagbajabyn Nymadawa, Zhaxybay Zhumadilov, Elvira Pocheshkhova, Marc Haber, Pierre A. Zalloua, Levon Yepiskoposyan, Anna Dybo, Chris Tyler-Smith, Elena Balanovska. Plos One. The Amardians, widely referred to as the Amardi (and sometimes Mardi), were an ancient Iranian tribe living along the mountainous region bordering the Caspian Sea to the north, to whom the Iron Age culture at Marlik is attributed. They are said to be related to, or the same tribe as, the Dahae and Sacae. That is to say, they were Scythian. Ancient Iranian religion refers to the ancient beliefs and practices of the Iranian peoples before the rise of Zoroastrianism. The Iranian peoples emerged as a separate branch of the Indo-Iranians in the 2nd-millennium BC, during which they came to dominate the Eurasian Steppe and the Iranian Plateau. Their religion is derived from Proto-Indo-Iranian religion, and therefore shares many similarities with Vedic religion. Although the Iranian peoples left few written or material evidence of their religious practices, their religion is possible to reconstruct from scant Iranian, Babylonian and Greek accounts, similarities with Vedic and other Indo-European religions, and material evidence. Their religion was polytheistic and the chief god of their pantheon was Ahura Mazda, who was recognized as the creator of the world. They had a three-tiered division of the cosmos into the earth, the atmosphere and the heaven above. Dualism was strongly emphasized and human nature was considered essentially good. The chief ritual of the ancient Iranians was the yazna, in which the deities were praised and the mind-altering drug hauma was consumed. This ritual was performed by a highly trained priestly class. Fire was worshiped as the deity Atar. Politics and religion under the Persian Empires were strongly connected. Beginning in the early 10th-century BC, the ancient Iranian religion was gradually displaced by Zoroastrianism, which contains many essential aspects of its predecessor. Ariana, the Latinized form of the Ancient Greek Ἀρ(ε)ιανή Ar(e)ianē (inhabitants: Ariani; Ἀρ(ε)ιανοί Ar(e)ianoi), was a general geographical term used by some Greek and Roman authors of the ancient period for a district of wide extent between Central Asia and the Indus River, comprising the eastern provinces of the Achaemenid Empire that covered the whole of modern-day Afghanistan, as well as the easternmost part of Iran and up to the Indus River in Pakistan (former Northern India).At various times, various parts of the region were governed by the Persians (the Achaemenids from 550 to 330 BC, the Sasanians from 275 to 650 AD and the Indo-Sasanians from 345 to 450 AD), the Macedonians (the Seleucids from 330 to 250 BC, the Greco-Bactrians from 250 to 110 BC and the Indo-Greeks from 155 to 90 BC), Iranian peoples from Persia and Central Asia (the Parthians from 160 BC to 225 AD, the Indo-Scythians from 90 BC to 20 AD, the Indo-Parthians from 20 to 225 AD and the Kushans from 110 BC to 225 AD), the Xionites (the Kidarites from 360 to 465 AD and the Hephthalites from 450 to 565 AD) and Indian empires (the Mauryans from 275 to 185 BC). Burtas (Russian: Буртасы, Burtasy; Chuvash: Пăртассем, Părtassem; Tatar: Cyrillic Бортаслар, Latin Bortaslar, Arabic برطاسلر or بۇرتاسلار) were a tribe of uncertain ethnolinguistic affiliation inhabiting the steppe region north of the Caspian Sea in medieval times (modern Penza Oblast, Ulyanovsk Oblast and Saratov Oblast of the Russian Federation). They were subject to the Khazars. The ethnic identity of the Burtas is disputed, with several different theories ranging from them being a Uralic tribal confederacy (probably later assimilated to Turkic language), and therefore perhaps the ancestors of the modern Moksha people, or that they were an Iranic tribe, possibly the ancestors of the modern Mishars. Recently, some scholars have suggested that the Burtas were actually Alans or another Iranian ethnolinguistic group. The Alanic (Sarmatian) origin is also derived from their name furt/fort (big river on Middle Iranian language) and as is Alanic selfname, as Ossetians (Caucasian Alans) and Jasses (Jasz, Hungarian Alans) all used the same name. Drangiana or Zarangiana (Greek: Δραγγιανή, Drangianē; also attested in Old Western Iranian as 𐏀𐎼𐎣, Zraka or Zranka, was a historical region and administrative division of the Achaemenid Empire. This region comprises territory around Hamun Lake, wetlands in endorheic Sistan Basin on the Iran-Afghan border, and its primary watershed Helmand river in what is nowadays southwestern region of Afghanistan. Encyclopædia Iranica is a project whose goal is to create a comprehensive and authoritative English language encyclopedia about the history, culture, and civilization of Iranian peoples from prehistory to modern times. Hunas or Huna was the name given by the ancient Indians to a group of Central Asian tribes who, via the Khyber Pass, entered India at the end of the 5th or early 6th century. Huna Kingdom occupied areas as far as Eran and Kausambi, greatly weakening the Gupta Empire. The Hunas were ultimately defeated by the Indian Gupta Empire and the Indian king Yasodharman.The Hunas are thought to have included the Xionite and/or Hephthalite, the Kidarites, the Alchon Huns (also known as the Alxon, Alakhana, Walxon etc.) and the Nezak Huns. Such names, along with that of the Harahunas (also known as the Halahunas or Harahuras) mentioned in Hindu texts, have sometimes been used for the Hunas in general; while these groups appear to have been a component of the Hunas, such names were not necessarily synonymous. The relationship, if any, of the Hunas to the Huns, a Central Asian people who invaded Europe during the same period, is also unclear. In its farthest geographical extent in India, the territories controlled by the Hunas covered the region up to Malwa in central India. Their repeated invasions and war losses were the main reason for the decline of the Gupta Empire. Indo-Iranian peoples, also known as Indo-Iranic peoples by scholars, and sometimes as Arya or Aryans from their self-designation, were an ethno-linguistic group who brought the Indo-Iranian languages, a major branch of the Indo-European language family, to major parts of Eurasia. Iranian mythology or Iranic mythology may involve in the mythology of Iranian peoples, a branch of Indo-Europeans. Below is a list of some Iranian peoples. This list of ancient Iranian peoples or ancient Iranic peoples includes names of Indo-European peoples speaking Iranian languages or otherwise considered Iranian in sources from the late 1st millennium BC to the early 2nd millennium AD. The Massagetae, or Massageteans, were an ancient Eastern Iranian nomadic tribal confederation, who inhabited the steppes of Central Asia, north-east of the Caspian Sea in modern Turkmenistan, western Uzbekistan, and southern Kazakhstan. The Massagetae are known primarily from the writings of Herodotus who described the Massagetae as living on a sizeable portion of the great plain east of the Caspian Sea. He several times refers to them as living "beyond the River Araxes", which flows through the Caucasus and into the west Caspian. Scholars have offered various explanations for this anomaly. For example, Herodotus may have confused two or more rivers, as he had limited and frequently indirect knowledge of geography.According to Greek and Roman scholars, the Massagetae were neighboured by the Aspasioi (possibly the Aśvaka) to the north, the Scythians and the Dahae to the west, and the Issedones (possibly the Wusun) to the east. Sogdia (Khorasan) lay to the south. The Nezak Huns were one of the four groups of Huna people in the area of the Hindu Kush. The Nezak kings, with their characteristic gold bull's-head crown, ruled from Ghazni and Kapisa. While their history is obscured, the Nezak's left significant coinage documenting their polity's prosperity. They are called Nezak because of the inscriptions on their coins, which often bear the mention "Nezak Shah". They were the last of the four major "Hunic" states known collectively as Xionites or "Hunas", their predecessors being, in chronological order, the Kidarites, the Hephthalites, and the Alchon. The term 'Hun' may cause confusion. The word has three basic meanings: 1) the Huns proper, that is, Attila's people; 2) groups associated with the Huna people who invaded northern India; 3) a vague term for Hun-like people. Here the word has the second meaning with elements of the third. The Ossetians or Ossetes (; Ossetian: ир, ирæттæ, ir, irættæ; дигорæ, дигорæнттæ, digoræ, digorænttæ) are an Iranian ethnic group of the Caucasus Mountains, indigenous to the ethnolinguistic region known as Ossetia. They speak Ossetic, an Eastern Iranian (Alanic) language of the Indo-European languages family, with most also fluent in Russian as a second language. The Ossetian language is neither closely related to nor mutually intelligible with any other language of the family today. Ossetic, a remnant of the Scytho-Sarmatian dialect group which was once spoken across the Pontic–Caspian Steppe, is one of the few Iranian languages inside Europe.The Ossetians mostly populate Ossetia, which is politically divided between North Ossetia–Alania in Russia, and South Ossetia, a de facto independent state with partial recognition, closely integrated in Russia and claimed by Georgia. Their closest relatives, the Jász, live in the Jászság region within the north-western part of the Jász-Nagykun-Szolnok County in Hungary. Ossetians are mostly Eastern Orthodox Christian, with sizable minorities professing Uatsdin or Islam. The Pāratarajas was a dynasty of Parthian kings, and ruling family from what is now Pakistan, from the 1st century to the 3rd century. The seat of their capital was Balochistan. The Pāratas are thought to be identical with the Pārthava of Iranian literature, the Parthians of Greek literature, and the Pāradas of Indian literature. Talysh (also Talishi, Taleshi or Talyshi) are an Iranian ethnic group indigenous to a region shared between Azerbaijan and Iran which spans the South Caucasus and the southwestern shore of the Caspian Sea. They speak the Talysh language, one of the Northwestern Iranian languages. It is spoken in the northern regions of the Iranian provinces of Gilan and Ardabil and the southern parts of the Republic of Azerbaijan. Northern Talysh (the part in the Republic of Azerbaijan) was historically known as Talish-i Gushtasbi. In Iran there is a Talesh County in Gilan Province.